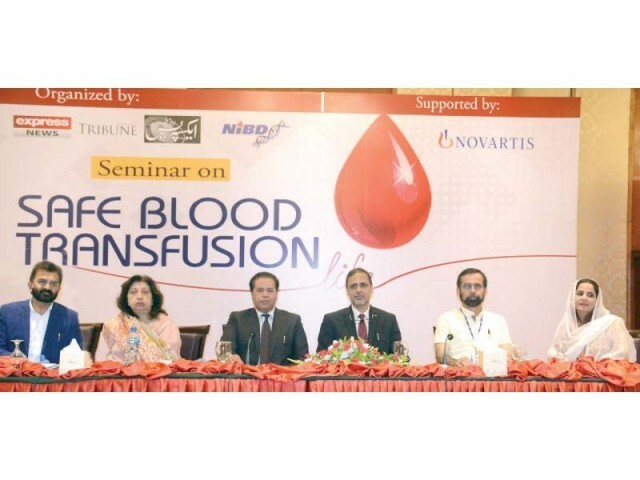 KARACHI: A seminar on ‘Safe Blood Tranfusion’ was jointly organised by the Express Media Group, the National Institute of Blood Diseases and Umair Sana Foundation at a private hotel in Karachi on Saturday to highlight the core issues that plague blood donation and transfusion. Speakers at the seminar lamented that in Pakistan, the procedure for blood donation wasn’t very clear and the standard operating procedures followed in foreign countries were neglected which resulted in the waste of blood. Moreover, blood banks were perceived as businesses though the reality was anything but, and this hurt the cause. Dr Durr Naz said that they stood by the people in need of blood, especially Thalassemia patients who needed blood donations the most. She said that it’s their mission to stop the diseases emerging through blood and stated that before blood transfusion is done, blood should be checked for diseases. She added that lesgilation with regard to blood transfusions began in 1977 and in 2017, the Blood Transfusion Act was passed by the Sindh government. “We need to spread awareness among masses to check the blood first while going for transfusion. Lack of resources is the biggest impediment in our struggle. Thalassemia patients, who need blood immediately in case of any accident or wound, should get it without any hassle,” she said. Dr Saba Jamal said that blood may have diseases and screening blood is necessary. For this, she said, “Testing should be done correctly and the blood pouches need to be kept in a cool place.” She informed the audience that their performance in the past four years had improved and they had established blood centers in Bahawalpur and Multan. She said that neglecting testing the blood for diseases could result in death. She praised the work done by Indus Hospital in providing blood to various areas of Karachi. Dr Zahid Ansari said many hospitals in Karachi carry expired blood and to ensure blood is not wasted, all the blood banks should remain in contact with each other. He added that they had been able to establish regional blood centres in Karachi, Hyderabad, Nawabshah and Sukkur. Dr Tahir Shamsi talked about the benefits of donating blood and said, “Chances of irregularities in the blood lessen when people regularly engage in blood donation and blood donation decreases the wastage of blood.” He added that their plan for the next 12 to 13 years was to establish infrastructure, reach out to people to increase blood donors and improve the blood production safety. He believed that this goal was achievable and would help in raising 7 to 8 million bottles of blood that Pakistan needed. He also praised NGOs for their active role, despite the lack of government support, in ensuring blood was available to those in need. Sindh Health Secretary Dr Saqib Nisar thanked the Express Media Group for organising the seminar and said that blood donation or a blood bank was not a business. He added, “Karachi’s NGOs are bearing 70% of the burden of this work for the past 20 to 25 years. NGOs have done tremendous work in this regard, played an important role in eliminating the drugged blood, but there is a procedure for blood donation which should be adopted.” He shared that in foreign countries, people themselves donate blood after every four months. He added that when blood is transfused 10 to 12 times in a person, Iron starts accumulating in their body which needs to be killed through medicines. He added, “All the communities residing in the country are facing this issue.” With the advent of new technology, Chachar hoped that work would improve and the system would be strengthened.